1. Place onions in bottom of Crock-Pot. 2. Rub seasoning over chuck roast and place over onions. 3. Add water to bottom of roast. 4. Place all vegetables except green beans around roast. 5. Cover and cook on high for 4 hours or low for 8-10 hours. 1 hour before cooking is complete, tilt cover of Crock-Pot away from you – being careful of steam – and place green beans in Crock-Pot. Replace cover and cook for 1 hour longer. 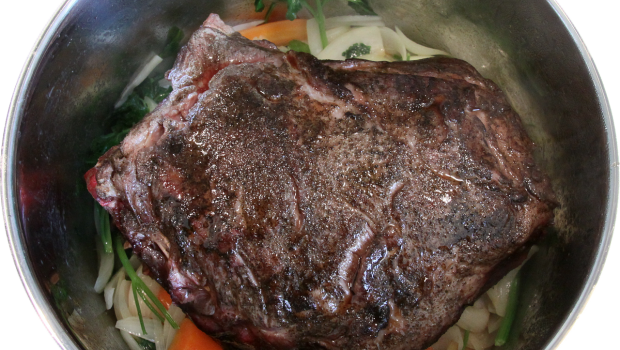 Tip: Searing pot roast in iron skillet before placing in Crock-Pot adds flavor to the cooking process. Simply heat skillet to hot with 1 tablespoon canola oil. Place seasoned roast in hot skillet for 2 minutes on each side and then transfer to Crock-Pot. Tip: if you want to have potatoes with pot roast, double cook potatoes on stove top according to directions on back of potassium handout. Do not add to Crock-Pot. Serve with pot roast. *From Adding Spice to Your Life by Duane Sunwold. **Gravy: For every cup of juice, add 2 teaspoons cornstarch blended with enough water to make runny. Bring juices to boil first, then add blended cornstarch, stirring constantly until thickened, about 1-2 minutes. Add your favorite blend of Mrs. Dash no salt seasoning and serve.